Apple is set to introduce a slew of new features to Mac when its next-generation macOS Mojave operating system sees release later this year. One of our favorite user interface tweaks is Stacks, a brand new way to organize files on your desktop. An average user's desktop might be cluttered with files and folders collected the years and arranged in no particular order. Apple has set about to remedy this organizational nightmare with Stacks, a new Mac feature that automates file and folder collation in macOS 10.14 Mojave. Clicking on Stacks in the View menu option instantly arranges a user's files into separate stacks. By default, the contents of each stack is organized by type, for example PDF Documents, Music, Movies and Screenshots. Everything else, including disk image and zip files, goes into a stack named Other. Folders, on the other hand, are kept separate and automatically sorted below created stacks. When a new file is introduced onto the desktop, it is automatically tossed into the corresponding stack, unless it's the only one of its kind. For example, we added a JPG image and it went below the stacks because there were no other pictures on our desktop. If we add another one, a new Images stack is created and both image files go inside of it. This works the same way for pretty much all file types, except for folders. Clicking on a stack expands it to reveal the files inside, which are directly accessible from the desktop. When you find the file you're looking for, you can easily drag and drop it anywhere in the OS, like an email message. All of the stacks and folders that sit below an actively open stack are moved to separate columns so they don't get mixed up. You can even open all stacks at the same time. Right clicking on the desktop brings up options for arranging Stacks groupings. For example, selecting Date Created arranges stacks by top, with the most recent files sitting in the top-most stack. Grouping by Date Last Opened is also useful for easily accessing all of the files a user recently worked on. Stacks can also be configured by macOS tags. Mojave lets users apply additional filters to each stack. So if we sort a stack by date last opened, the most recently opened file will show up at the top of the list. Right click on a stack to access to a list of actions, including new folder creation, sharing, copying or performing a set of Mojave's new Quick Actions. Really looking forward to this feature, it’s little details like this I love. Good stuff. When I see people's desktops with a seemingly random spew of files I tend to think that these people also have many months worth of cheese encrusted fast food wrappers crumpled up on the seats and floor of their cars. Kind of like "Hoarders: Mac Desktop Edition." I don't happen to be a desktop file hoarder but I do see the value in auto-organizing files using contextual clues and/or facets. Great idea. My perception though is that the Desktop metaphor is associated with a single, typically local machine while the greater potential for disorganization is with files stored in iCloud where they can be accessed from multiple desktops from a larger and more heterogeneous collection of devices. Yeah yeah, I know that you can mirror your Mac's Desktop folder to iCloud but that has always seemed like a clash of metaphors. In summary, Stacks looks like a good feature for desktop file hoarders (who should clean up their Desktop anyway ;-) ) but it would be much more useful for addressing content management for iCloud and shared storage systems where the size, scope, and negative productivity impact of disorganization and disarray are potentially much worse. Having the scope of this feature bound to one machine's Desktop is okay for now but ultimately way too limited. How will stacks affect memory usage. I have been told not to keep a lot of files on the desktop because it is a memory hog. I find that hard to believe. What would be the argument to that? In the end it’s just another folder in the file system, but one that is visualized differently. If there’s a difference, it would be minimal. It would mainly affect boot times because previews would need to be created. Stacks are a great idea. People often keep “working” files on the desktop, but forget to archive them. By changing the Stack by Date it would make them easy to organize and archive. It’s nice to see Apple focusing on productivity and simplicity, rather than the feature boat of Windows. I’m a Windows user and dislike Windows 10... it’s a mess. Loving Stacks on Mojave's Desktop, but I'd like to see an option for Stacks to open up to the left (instead of just down), as well as an option for an overlay (like with folders in the Dock) so that the other icons on the Desktop don't all shift with Stacks is invoked. 1) Desktop icons taking up RAM isn't a myth, but I think it's a long-outdated concern with how much RAM we now have on these machines. 2) I don't think it acts like "just another folder." If you go into Finder under Desktop you won't see your stacked items listed as being in a folder, but each item listed individually. I think it acts more like each file literally stacked over each other, which I'd guess is taking up space in RAM like before, along with the stack data. Again, nothing to be alarmed about in 2018 in terms of memory usage. On point 1, back in the OS 7-8-9 days, rebuilding the Desktop seemed to take longer when you had a bunch of files located there. And of course, memory was at a premium, like 32 megabytes of RAM. Seems almost absurd now. Instead you would use an alias for everything. These days I almost never make an alias for any files on the Desktop. Yes I remember this from back in the days of 10.1 and 10.2. The early versions of Mac OS X weren't designed to have icons on the desktop, so as a workaround, every time you dropped an icon on the desktop they created a little transparent borderless window to hold it, so if you had 100 icons on your desktop you effectively permanently had 100 windows open, which used a lot of memory. But that hasn't been the case for many versions. That is why I'm not sure this stacks feature will be generally popular, because while it looks very slick it sacrifices instant, muscle memory accessibility for the sake of tidiness, which is generally a bad trade. Unless you're someone who really, really values tidiness and is willing to hunt and peck each time in order to have that, in which case those people yes they will like it. I've never cared for the Downloads folder that Apple added many years ago. I've always redirected my downloaded files, soon to be used files, and other limbo files to be saved to the Desktop. This is going back long before Mac OS X was available and yet I'm loving Stacks on my Desktop. It's not a feature I had ever considered—for which I'm mildly surprised—but I'm finding it incredibly useful because it does add an extra layer of organization and because it also means I don't have to move windows as more items can placed in the single, right-hand column which I usually leave open for quick access to the Desktop with my Dock placed on the right left side of the window. Verticle space is more important to me so I don't care for the Dock at the bottom. Good point about window moving. What I do currently is have the top-right hot corner set to "Show desktop" so by moving the mouse there all the widows zoom out of the way and I can see the desktop, but a nice vertical column of stacks might be even faster. I'm still a Hot Corners user, too. I wonder how common that is. For me, (going clockwise) the upper-left is Dashboard (as an overlay), the lower-right is show Desktop, and the lower-left is Mission Control (which replaced Show All Windows), and the upper-right is the screensaver (which locks my Macs). Trying out the new dark theme I see! I just have the desktop hot corner and then mission control on the middle mouse button. I used to have screen saver on a corner, also for the purpose of locking, but 1 or 2 releases ago they added a lock screen menu item to the Apple menu and I have managed to retrain myself to use that. By the way you were right about macOS staying a separate thing, Craig was clear on that. I thought they would add window/mouse support to iOS. So good call on your part. 1) Do you mean this from the '' symbol in the Menu Bar? If so, isn't that more time consuming that simply swiping the mouse cursor up to the corner? I use the trackpad on my MBP so I don't get any of the benefits you mentioned with a middle mouse button (as far as I know). I didn't even know that "Lock Screen" wasn't an option before 1 or 2 macOS released ago from that dropdown. 2) While I can't see macOS and iOS merging (only getting more unified underpinnings for easier development), I can see a future where iOS will be usable with a trackpad/mouse in a limited fashion. While there's no reason to ever make it a Windowed OS there are plenty of areas, like text fields, where having something like an iPad Pro on a stand, connected to a keyboard and mouse could be useful, but I wouldn't expect to see any Right/Option clicking for contextual menus to appear unless it mirrors what we already see with iOS long-pressing on text and I'd expect to appear in the exact same way, not as a list like we see with macOS. 1) Do you mean this from the '' symbol in the Menu Bar? If so, isn't that more time consuming that simply swiping the mouse cursor up to the corner? I use the trackpad on my MBP so I don't get any of the benefits you mentioned with a middle mouse button (as far as I know). Yep hot corner would still be quicker. But for me using screen saver to lock was always a roundabout way of doing it so when they added an explicit Lock command I thought better to use that. That way if Apple is collecting analytics to decide what features to keep and what not, they will see that people actually do want to lock, rather than concluding people just want to turn on their screen saver. I agree that on a mouseified iOS menus are one of the things that would likely be different, contextual and global. Segue… They've had the Apple Watch unlocking a Mac for years (which is something I wanted even before the Watch was announced), but I also want my Mac to auto-lock if my Watch gets too far away from my Mac (and iDevice), too, and that feature hasn't appeared yet so I'm giving up on that wish. I'm also giving up on my wish for a "poison finger" trigger with Touch ID that would cause your device to not just lock, but require the full login password if ever invoked. Auto lock when you walk away and auto unlock when you approach would def. be ideal. Maybe they could do Face ID every 5 seconds with the MBP camera at some point. I think iOS 11 has got a duress code so don't give up, Mac might get it too! Are you referring to the multiple clicks on the Home Button (or some combination like that? 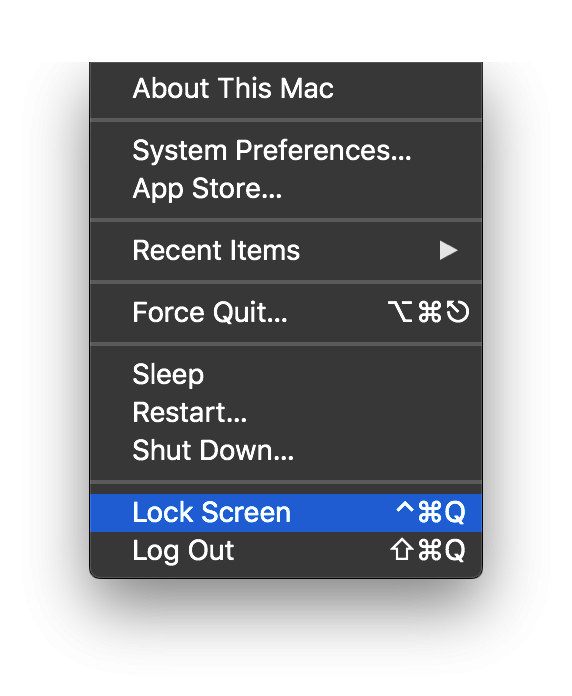 With macOS you already long-press the Power Button and it'll turn off, which on iOS I think only calls the slide to turn off unless you do a two-button combo. Speaking of macOS desires (and this is a very minor request), I would love for the WiFi dropdown to not sure every SSID that exists in any area when you click on it. I'd like for it to only show the ones that you've previously connected to with the row at the bottom of that list with something like "Other WiFi Networks…" The list is just so long these days and SSIDs I've previously connected to aren't auto-displayed at the top but are often buried in a very long list. PS: I tested out connecting to a previously unknown WiFi network via watchOS 5 today. Straightforward. Putting in the password was easy enough even with having to draw each letter for the password. I have yet to test this with a protected WiFi network with a splash screen, but I'm hoping the inclusion of WebKit in watchOS 5 means this is possible. That said, I remember how slow companies were to respond with supporting WebKit and the 3.5" display of the highly popular iPhone which usually made authenticating at a hotel with your iPhone a chore and on rare occasions impossible. I'm assuming it'll be even worse for the Apple Watch in this regard. I'd also like to see both VPN apps supported with the Apple Watch and the ability to tether to, say, a MBP if you have an Apple Watch with cellular, but these are probably a long time coming as I've seen no one else recommend those features but me. Those are good ideas, the list of SSIDs is pretty unmanageable if you live in the city. One cool thing about the WiFi menu on the Mac that I only saw for the first time the other day was that when I had my iPhone down next to my Mac, the option of "4G Personal Hotspot" appeared at the top of that menu. The duress code I was referring to is that on iOS 11 you can tap power 5 times to activate SOS mode which is supposed to be about contacting the emergency services. But what Apple did is, as a side effect of that, they also disable Touch ID. So you see it gives you a deniable way to disable Touch ID. If the police are coming you can just say you activated SOS mode because you were scared, but you were really trying to disable Touch ID. And then if they ask for the password you just plead the 5th. It's understandable why law enforcement get peeved at Apple honestly!